I'm so excited to share that you can now shop 12th and White at ReLove All Things Shabby in Wichita (Central and Woodlawn)! I've teamed up with the talented Lisa of Milk + Honey Candles to share her space, which is already filled with the most delicious candles and darling furniture, at this fun local boutique. It's a small booth, which is good for me. I pulled out of The Cottage a few months ago because keeping up with a retail space in the midst of working was just a lot. But this is much smaller scale and I think will be way easier to manage, so I'm trying it out. I got to take my things in this weekend and do a little fluffing in the space. Lisa already had it looking darling with her own finds, some gorgeous furniture pieces and the most tempting candles, and I just added to it with some vintage goods. I love this arched window paired with the antique tin ceiling tile. The other accessories are Lisa's - doesn't she have great taste? 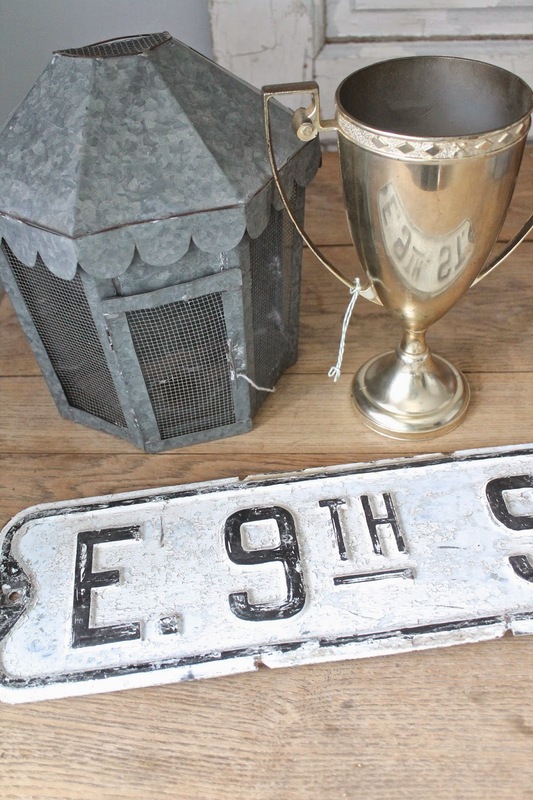 I have a great piece of French stripe fabric, a large brass trophy, several pieces of ironstone, a couple scales (actually this gray one already sold), a silver sugar jar which to me looks like a trophy, and quite a few other great pieces! This cool bread box (not old but looks like it!) is also available for $49. Be sure to come by and check it out! ReLove is open Monday - Saturday 10-5, and until 7 on Thursdays. What an awesome space! It is all just so pretty! Wish I could shop there! B3est of luck in your new space - seems like a perfect pairing of talents. YAY!